By rights, it shouldn’t even exist, the product of a fan from Holland sneaking a one-channel reel recorder into a series of London shows to capture a band that performed together for only three months before three-quarters of its members decided to, well, go their own way and form another outfit whose name derived from the surnames of drummer Fleetwood and bassist McVie. 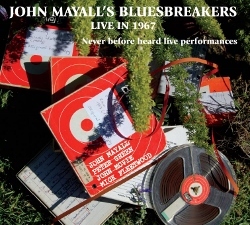 That first band may not have been together long enough to record in the studio, but nearly 50 years later, we’re fortunate to now be able to hear these blues/rock n’ roll masters playing together on this treasure from Forty Below Records, John Mayall’s Bluesbreakers – Live in 1967 (Never Before Heard Live Performances), featuring John Mayall on vocals, harmonica, and keyboards, backed by one of the most talented Bluesbreakers line-ups in the band’s history with Peter Green on guitar; John McVie on bass; and Mick Fleetwood on drums. Taken from recordings of the band at five different London clubs, the sound here admittedly is not always the greatest, even with some pretty good restoration from Forty Below’s Eric Corne, with instruments at times fading in and out during solos and Mayall’s vocals in particular tending to be quite muddy. But we couldn’t agree with Corne more when he states “While the source recording was very rough and the final result is certainly not hi-fidelity, it does succeed in allowing us to hear how spectacular these performances are”, including some delightful solos from both Mayall and Green to complement Mayall’s impressive vocals. That applies from the very first song, with the band slinking in on Otis Rush’s “All Your Love” before taking things full throttle about halfway through and then bringing it back down again just in time for the track’s conclusion. If that song alone isn’t enough to hook you, there’s plenty more where that came from, including a creeping “Double Trouble” (another of Rush’s songs) and the 1-2-3 punch of the slow blues of Freddie King’s “Have You Ever Loved a Woman” featuring some Kansas-sounding tinkling of the ivories from Mayall (several years before Kansas would have been heard), the always fun tongue-twister of a tune “Looking Back” (Johnny “Guitar” Watson), and a passionate take on Rush’s “So Many Roads” that together make this set every bit worth its purchase price. In addition to the Rush and King songs already noted, the album also includes takes on Rush’s “I Can’t Quit You Baby”, King instrumentals “San-Ho-Zay” and “The Stumble” – the latter featuring some particularly stinging guitar from Green – and a simmering “Someday After Awhile” (King), as well as a few other blues classics in Tommy Tucker’s “Hi Heel Sneakers” and the intense, closing “Stormy Monday” (T-Bone Walker), offering further evidence of the tremendous influence of such U.S. artists on British blues bands of the time. Also included here are a few Mayall originals in “Streamline” and a “Brand New Start” that features Mayall on harmonica along with some fiery guitar from Green, proving that these guys could excel at whatever they were playing, including what may very well be some of Green’s finest work ever. With the fan having taped five shows, we can only wonder what other treasures from these performances might still be out there – and whether there’s enough of them to make a volume 2… In the meantime, though, we’ll be listening to this one a whole lot more. This entry was posted in Albums and tagged Eric Corne, John Mayall, Mick Fleetwood, Peter Green. Bookmark the permalink.